These are low cost controls for any Float Switch operation. This control comes in four different configurations: Single Float pump up or pump down, Two float pump up or pump down, single float pump up or down with a second float for a low alarm or high alarm and a pump up or down using two floats with a high or low alarm. At this point we do not supply the float switches. We supply these controls so the voltage in the water or wet area meets the UL requirements not to exceed 24VAC. These will always operate less the 24VAC through the float switches. The enclosure is a NEMA6R and ideal for wet applications. Ask your contractor how he plans to operate the floats so you know he is using some sort of low voltage system. While we prefer the low voltage electronic sensing system we developed we realize that it may not always fit into the budget and has more features and functions than are needed for your application. 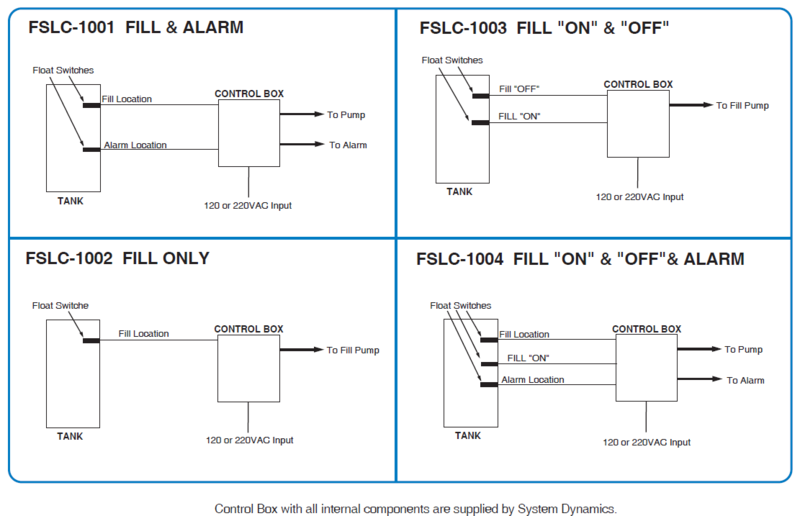 The FSLC SERES is a Waterline Controls Unit manufactured by System Dynamics, Inc (888-905-1892) and supplied by System Dynamics, Inc (888-905-1892) shall be supplied as a unit with float switches. These units are set to operate a contractor for operating pubs or other contactors for larger pumps. The level control system shall consist of solid-state parts with non-corrosive components and is suitable for use outdoors in a wet application or indoors in a mechanical room environment. The level control system will provide ease of operation, ease of service and accessibility. The Control Panel shall come with a 5 Year Limited Warranty. The Float Switch level control system can be automatically controlled with any Electric Float Switch suitable for the application. These Controls operate a relay rated at 30AMPS for 250VAC. The water level control system is comprised of an Electric Float Switch mounted to monitor the level of the environment. The WaterLine Controls control panel is mounted outside of the tank or wet environment but within a distance of less than 50 feet. The WaterLine Float Switch level control panel shall draw no more than 0.25AMPS at 110VAC or 0.125 Amps at 220VAC. All power relays are rated at 30Amps at 250VAC for the normally open relays and 20Amps at 250VAC for all the normally closed relays. The Control Panel is of modular construction such that the components that control the above features can be removed and replaced as needed over the lifetime of the system.